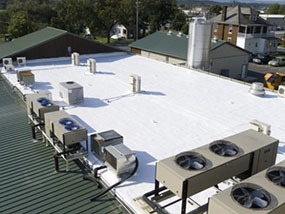 When it comes to commercial roofing services, you have to look for the most dependable and reliable company. Repairing, maintaining, or replacing a building’s roof is an important, sometimes expensive task that must be done right. You want someone you can trust and depend on. We at E&E Construction have been serving businesses and commercial building owners in Lancaster, Ohio, and the surrounding areas for more than a decade. We are a team of highly trained, skilled professional roofers who provide exemplary services at affordable rates. If you are interested in our services, you can call us now at (740) 331-0695. Leak detection – Some leaks can travel through roofing material, making it hard to figure out where the leak originates. Our team of skilled roof technicians are trained to detect leaks, no matter the roofing material. Roof Repair – We provide every type of roof repair – tears, cracks, bubbles, excessive wear from foot traffic, etc. Whether it’s a flat roof repair, metal roof repair, foam roof repair, or rubber roof repair, we can handle it. Spray foam roofing – We perform spray foam roofing (SPF) application, providing high-grade insulation and exceptional protection, safeguarding your roof and building from the elements. 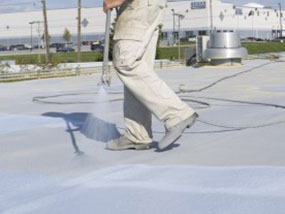 Roof Coatings – We can apply a variety of roof coatings to your flat or metal roof. We use high quality products manufactured by Conklin Roofing Systems. Roof Replacement – We provide our customers with roof replacement service for all types of roof, including metal, TPO, modified bitumen, EPDM, PVC, BUR, and more. Roof Inspections – Our team of professional roofing technicians offer regular commercial roof inspections as part of an ongoing maintenance program. Each job begins and ends with a comprehensive roof inspection. Roof Maintenance – E&E provides ongoing, customizable maintenance plans for all commercial roofs, including debris removal, small repairs, and more. E&E Construction stands apart from the competition in many ways. We don’t just offer our clients premium, quality products; we have the experience and superior skills of our exemplary trained professionals to provide our clients with unmatched performance when it comes to commercial roofing services. If you’re looking for commercial roofing services for a building in Lancaster, OH, E&E Construction is the right choice for you. You can call us at (740) 331-0695 to get an estimate and start your partnership with us today.